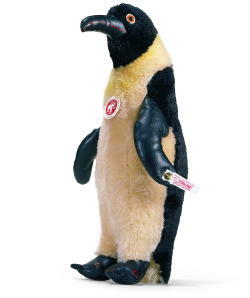 13", 2006, Steiff first produced this mohair penguin for children in 1928, in honor of Richard Byrd’s Antarctic Expedition, which for the first time brought the beauty of this polar region to the world. Today’s Admiral mirrors the features that made the 1920’s version so revolutionary at the time. His legs and beak are complemented with red paint, which has been carefully applied by hand. His pupil eyes are backed in felt, giving them a realistic effect. And his pudgy body is “weathered” with light airbrushing, as if he has just dried off after a playful swim in the ocean. Wings, beak and feet are made of soft leather. His beak and feet are hand detailed.